Captain Ken from Chasin Tail brings home another win! 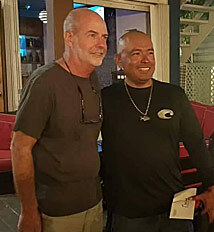 “Best Guide and Top Boat,” for the 4th time in the Tres Pescados Slam Tournament, in San Pedro, which is the biggest fly fishing tournament in Belize over the past 6 years. Ken and Yellow Dog beat out 21 teams! Chasin’ Tail’s guide Captain Kens biggest accomplishment for the year was winning “Best Guide and Top Boat,” for the 3rd time in the Tres Pescados Slam Tournament, in San Pedro, which is the biggest fly fishing tournament in Belize over the past 6 years, dominating over 15 boats by catching the “Grand Slam” in one day! Team Anglers Abroad, Haywood Curry and guide Ken Coc from Caye Caulker take 1st place in the 2nd annual Tres Pescados Slam Tournament held Thursday August 12th through Saturday August 14th. 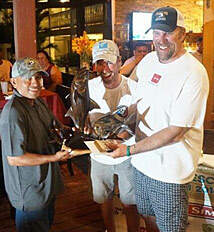 Along with winning the event’s 1st place trophy, Ken Coc won the “Top Guide” trophy and Haywood Curry will be going to Islamorada, Florida in July 2011 to compete in the IGFA Inshore World Championships representing Belize. 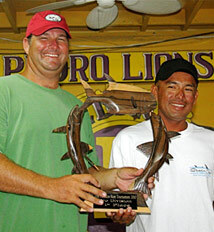 Winning angler Haywood Curry(left and guide Ken Coc (right), celebrate. The Awards Banquet was hosted by the San Pedro Lions Club at the Lions Den. With sponsors, anglers and guides attending the trophies and winnings were handed out. Team Anglers Abroad (Haywood Curry and guide Ken Coc) took home $3,500 for the Pro Division 1st Place, team Fly Guyz (John and Sam Hart with guide Abbie Marin) won $2,333 for the 2nd Place Pro Division, and 3rd Place winners team Red House (John Winkler with guide Darrell Castenanos) headed home with $1,166. Team Bad Boyz (Mario Graniel and Alejandro Rodriguez) for the Amateur Division took home $1,500. The Pro and Amateur names and the Top Guide name will be added to the Perpetual Tres Pescado Slam Tournament located in the San Pedro Town Council office. One of the key areas of this event is to raise awareness and funds to help the protection, education, research and enforcement of the catch-and-release for the bonefish, tarpon and permit. All of the team members in the event helped gather census data for the tournament. 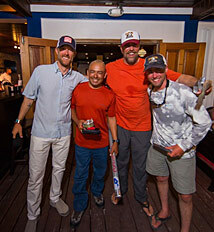 The funds raised from the many sponsors that supported this event allowed the tournament to hand over a $6,000 check to Green Reef in support their ongoing Sport Fish Program effort needed to protect the over $60 million dollar resource that these 3 fish represent to Belize.